I’m taking a break from gardening and cooking today to talk about something completely different: infusing coffee in oil. Before I get into the how-to part, the first thing you might be wondering is ‘why on earth is he doing this and what is he going to do with it?’ I’ll get to that in a minute. While infused oils are popular in the kitchen, flavored with things like garlic and herbs, many people are unfamiliar with their use in other ways. And this coffee oil is not destined for eating or cooking, though it is possible some of it will wind up on my body! For background, my wife and I have been making soaps, lotions, balms and other personal care products for several years now. And occasionally, coffee has a starring role in them. For Christmas in 2011, she made some awesome coffee flavored lip balm to give away as homemade presents. Of course we used it too. And recently she made some coffee hand cream, which I absolutely love. With all that coffee action going on, I had the bright idea to try and make a coffee bath soap, plus some more coffee lip balm. So a coffee infused oil seemed like a good thing to make for both projects. I chose olive oil this time, but any carrier oil can be infused. Other popular choices include almond, coconut, and jojoba oils. And all kinds of herbs and flowers can be infused too. My wife is currently making separate infusions of calendula flowers, nettle leaves, and plantain. For her infusions she is using either almond oil or coconut oil. I picked olive oil because it is a major ingredient in all of our soap recipes, and it is a good choice for lip balms as well. Olive oil is one ingredient that is great for your body both on the inside and outside. But then, so is coconut oil for that matter, and I love it for lip balms. UPDATE: Check out my recipe for Coffee Lip Balm. This oil is also great in my Chocolate Lip Balm. To infuse the coffee in oil, you can use either one of two methods. If you have plenty of time, you can use the cold infusion method by adding the coffee and oil to a clear glass jar and letting it sit for a few weeks (up to a month). I’m anxious to get my projects done sooner than that, so I chose the hot infusion method. I used equal parts of medium grind French Roast coffee and a good quality, mild-flavored olive oil. I put the coffee and olive oil in a small crockpot and turned it on low for about 8 hours, stirring occasionally. After that, I turned it off and let it sit until it was cool. The cold infusion method is generally recommended for leafy herbs and flowers, though I haven’t found any science to back that. So that was a good choice for my wife’s infusions, where she is looking for the healing properties of calendula flowers and the anti-itch action of plantain and nettle leaves. I’m mainly interested in the aroma, color and flavor of the coffee in the oil, though it is supposed to be good for your skin as well. And besides, coffee grounds are pretty tough, and brewing with hot water is the usual method of ‘infusing’ them before they wind up in a coffee cup! After infusing with either method, the coffee grounds need to be strained out from the oil. I placed a coffee filter into a fine mesh strainer set over a glass measuring cup, and carefully poured the oil in. It took several hours to drip through the filter and strainer, but the result was an infused oil that was free of any bits of coffee. You can use old, clean nylon stockings to strain the oil from an herb or flower infusion, and that process will go much quicker, though the oil may still have some coffee residue. After straining out the grounds, they went into the compost pail where they will ultimately wind up enriching the garden. The oil is a dark brown, almost black color and the aroma is like a cup of fresh-brewed coffee. I am very pleased with how it turned out. Quite a bit of the oil was absorbed by the coffee and the filter (about half of it) so be sure and start with about twice more oil than you need for your project. The shelf life on these non-edible infused oils is about the same as the shelf life of the plain oil. In my case, olive oil has a shelf life of about a year, if kept in cool dark place. For coconut oil, you should be able to go by the expiration date on the label of the oil you use. I want to emphasize the need to use high-quality ingredients for this coffee infused oil. Be sure and use a coffee you would drink, not some cheap brand. And the same goes for the oil. I use extra-virgin and organic coconut and olive oils for all my homemade skin care products, and an expelled-pressed food grade sweet almond oil. UPDATE: Since I first wrote this, I have done several more batches of coffee infused oil. My current favorite for lip balm is a medium roast coffee infused for about two hours in extra-virgin coconut oil. For a coffee skin salve, I use either almond or olive oil, and for soap I use olive oil. The coffee infused oil can be used to color soap, but the aroma is lost during the saponification process. 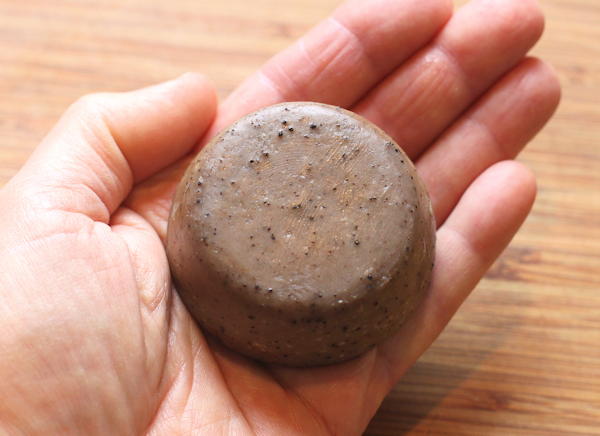 Check out our Mocha Java Hand Soap to see how the infused oil colors the soap. This entry was posted in Homemade and tagged coffee, infusing, lip balm, soap. Bookmark the permalink. neat! that coffee infused oil is so pretty! I think i like the idea of coffee soap – I can see I’m going to spend the next few months checking out the soap stands at markets to see if they do coffee. Very original idea, I might have to give that a go! Can I use this oil in my baking since olive n coffee are edibles? Yes – everything is edible! Have you tried a cheese cloth as a strainer? That’s what I use and it works great! That’s very cool. I’m a novice soap maker and am just beginning to make my own recipes. Coffee soap was the first one I thought of that sounded fun and interesting. At first, I thought I would add ground coffee to the soap after trace, but now I think I’ll just superfat with coffee-infused olive oil after trace. The ground coffee makes a great exfoliant. And using brewed coffee for lye water give the soap a great coffee color too. Hey do i necessarily have to strain this if i want to use the ground coffee as an exfoliant? No, there’s no need to strain if you want some scrubby action too! Did the coffee infused olive oil actually smell like coffee after the soap had cured? Angela, I have not made soap with the infused oil. It makes a great lip balm or body lotion, and the coffee smell really comes through for those! I believe in soap that much of the smell will disappear. The infused oil keeps about as long as the base oil does (olive oil) is it is kept in a cool dark place. The scent and color stayed strong, though some of the coffee particles do settle to the bottom with time. I think that for lip balm, the flavor was a bit strong. I might use a milder roast coffee for that purpose. And for a body/hand salve, I would probably use almond oil (or another less greasy oil) instead of the olive oil. Thanks so much for this. I have infused coffee in coconut oil a few months ago but unfortunately many of the coffee specs fell through the cheesecloth I was using when straining. I used French Roast turkish grind (very fine) coffee. I want my finished product to be completely coffee spec free (like yours!). Do you suggest I simply use a coffee filter in a fine mesh strainer or should I also use medium grind coffee? I would use a coarser grind coffee AND strain through the coffee filter. I did another batch just this week and that’s what I did. I hope it works out well for you! Thank you for your response, Dave. I took your advice and the oil turned out great. I chose the cold infusion method – used organic almond oil and organic fine ground coffee. For those wondering, I used unbleached Coffee filters (Brand: “If You Care”) and a 3 inch mini strainer (Brand: OXO Good Grips). I used my batch to make a bronzing lotion bar. Thanks again! That is good info to know Mariana! I’m still working on a lotion bar recipe, and I will share it once I get it like I want it. Hi, I know this doesn’t keep to the natural and organic tone. But I am curious about using instant coffee. Has that been tried? Would it hold? I have never tried using instant coffee, so I can’t really say how that would work. I don’t think you would call it an infusion though, more like ‘instant coffee flavored oil’! Have you tried it with instant coffee? Did it hold? No, I haven’t tried with instant coffee. As a matter of personal preference, I like to use high-quality ground coffee, one that I would be happy drinking. I tried your idea of infusing coconut oil with coffee. When it cooled it separated. Any thoughts as to what went wrong? I sometimes have a little coffee residue left after filtering. Is that what you mean? If so you can strain it again, or stir it up before using. Or let the residue settle and pour the top part into another container. I love the little crockette!! Do they still make those anymore that size and what brand is it? I have a medium size Rival but can’t find it. Which is the best oil to use for making infused coffee oil in your opinion? I was wondering if Grapeseed oil would work or would a thicker oil be better? Have you tried Jojoba oil or Apricot kernel oil? I’m currently in the process of making a cold infused orange rind infused oil leaving it in the sun for a few hours a day then in a warm place at night like near the heater. I tried to make it on the stove top with a pot and it simmered but was boiling and the orange rind turned brown & hardened and what do you do if the steam produces water droplettes from the cover and goes into the oil? I used sweet almond oil with coconut oil. This is my first time making this concoction and would like to know what if can be used in? Is it like an essential oil or a fragrance oil? I would like to put it in bath salts, lip balms, face creams & serums-especially the coffee oil is so good for wrinkles under the eye area. Can it be used alone directly on the skin? Hi Anastasjia, the crockpot is a Rival brand and holds about 6 cups. We’ve had it for years and I have no idea where it came from. As for oils, the end use should guide your choice of oils. I’ve infused all kinds of oils, including olive, sweet almond, coconut, jojoba and apricot. The infused oil won’t be like an essential oil or fragrance oil. The longer you infuse it, the stronger the color and aroma will be. It is great in lip balms and body butters, or used directly on the skin. Have fun experimenting! Thank you so much for sharing the oils you have tried and the crockpot!! I agree, I don’t think that little one is made any longer unfortunately. If it was, I would buy it instantly! Ok, so I’m making my orange rind infused oil by using the cold method with coconut & almond oil and it has been brewing since April 1st & it says to turn it upside down once everyday for a few seconds. The aroma is delicious & ever day it gets better. I’m wondering if you need to use a preservative such as Vitamin E so mold won’t develop? I’ve heard olive oil is the best to use to prevent mold developing. I shall let it brew for 5 more days then strain it. Do you sell infused oils in your store? It is time consuming using the cold fusion method. Have you ever made coffee butter and do you have a recipe for it please? I know infused coffee oil is used in it. I bought some recently and it smelt & tasted like burnt coffee and many customers complained about it. I’d rather make my own than purchase it even though it’s a great deal of work. I’m starting on making cold infused coffee oil with coconut oil and almond oil and I agree I think it should be warm infused for better flavor. I love all your tips and recipes hope you post more!! I have never infused orange rind and have no experience with it, so I can’t say if a preservative needs to be used. And we don’t sell any of our soaps or body care products, we just make them for our own use. As for the coffee butter, I have never made it either. I used the oil to make lotion bars, and thicker salves, but never a whipped butter. Thank you for sharing …. Im planing to do coffee infused coconut oil and use it for CELLULITE. Do you think it will help or i should rather purchase coffee essential oil and mix it with coconut oil and and apply on my skin. ? Please advise. I have no experience with using coffee oil for that purpose, so I’m afraid I can’t help you there. Some people use strong coffee to tint hair but it strikes me that an ongoing use of coffee infused oil might work better … follow it up with a heat gun to set it. Has anyone tried that? I am super excited to try this! Thank you for posting. I hope you like it Dee! I made another batch last week using a dark espresso roast, heated in the crock pot for about two hours. It is yummy, and the oil is dark and fragrant. What was the ratio of coffee grounds/oil that you used for this coffee oil infusion? I used equal parts (by volume) oil and grounds, one cup of each. I am going to try the lip balm! I really want to make a coffee scented candle using soy wax for my mother. Can I infuse the soy in the crock pot with the coffee? Would this work? Or would the straining part be a problem as the wax might harden too quickly! Suggested? I use the lip balm every day, and it is my favorite for sure. I have never tried infusing coffee in any kind of wax. I do think straining would be a problem. I’m also not sure how much scent would wind up in the wax even if you could get it strained before it solidified. I would go with a coffee scented fragrance oil or essential oil for a candle. Dave: I am making this oil to add to my kitchen soap dispenser so that every time the soap is used the kitchen will smell like coffee! Any suggestions for other variations for this application? I don’t have any suggestions for you. I have no experience with liquid soaps, or using the oil that way. I make body scrubs and have been wanting to make a coffee scented one. I think this will be perfect for that. Thank you! I have been using coffee infused oil in my body and hair butter and eye cream . I did the slow infusion method. I did this and ended up with a burnt coffee smell (gross!) Next time I’ll use the cold method and maybe a lighter roast. Sometimes less time and a lighter roast is best when using the crockpot method! i’ve just tried the hot method and it left a horrible smell. does this always happen or…? There is an aroma of coffee while doing the infusion, but I’ve never found it to be all that bad. Hi! I’ve mixed instant coffee with lotion to get some color on my skin, but now I’m interested in using oil on my skin to get some of that natural glow too. Obviously the instant coffee doesn’t dissolve in oil, so I was wondering how much color do you get by doing this? If you just put coffee infused olive oil on your skin, will it show? I’m not exactly pale, so I’m afraid this method will give less color than the lotion. The coffee infused oil can be quite dark if you use a dark roast coffee and let it infuse long enough. I’ve never tried to color my skin with it though, so I can’t help you much with that. I have several bags of flavored coffee beans left from when I belonged to a coffee club. Has anyone tried using beans instead of ground coffee? I’ve never tried whole beans, only ground. amazing! thank you so very much for posting this. also, to note, it’s awesome that you actually answer practically every post and question! and if you don’t know, you just simply say that you don’t know! many bloggers don’t give that much attention and diligence to their readers! I appreciate that you do ))) you just gained one more dedicated reader! here’s my question: I do coffee scrubs by simply mixing espresso ground organic coffee+coconut oil+shea butter+cocoa butter+coconut palm sugar+essential oils. I use freshly ground coffee, not after it’s been brewed; I’ve read that brewed coffee loses its potency (i.e. caffeine strength), it’s still effective, but not as much. Do you think that after doing the infusion, instead of throwing away the infused grounds, they would still be potent to “recycle” them into a body scrub? Or are they just rendered useless with the caffeine gone completely into the oil? what does your experience tell you? I have not tried using the grounds after the infusion, but I think they could be used for scrubbing. I doubt there would be much caffiene or essential oils left after the infusion though. thank you for the post!.. …for this last batch of coffee oil, I used an espresso roast, the oil is a lot “richer” & I strained several times…also I’ll use a variety of oil, but usually go with grapeseed, almond or olive…or a combo..
Hi! I want to make coffee lip balm, and tried infusing coffee grounds in coconut oil in the crock pot last night. It strained great, but now after cooling overnight on the counter, the coconut oil is still liquid. I’ve never had that happen before. Do you know why it wouldn’t solidify like coconut oil usually does? (Maybe something to do with breakdown of fatty acid chains??) Thanks! Hi Marisa, I have no idea why the coconut oil is staying liquid. Mine always solidifies once it cools below the melting point of the oil. I am making a homemade coffee themed care basket for a friend. In my search for various recipes for different additions I came upon this article. I would love if you could share the coffee oil hand cream/balm recipe!! Thanks! Blessings!